I rode my bicycle past your window last night, pop singer Melanie sang way back in 1971. It didn’t sound that scary back then did it? Is anyone threatened, now, if I want to roll my little blue bike safely along city streets? We know that bicycles use fewer resources than other wheeled transportation, reduce congestion and take less parking space. We also know that riding bikes promotes personal health – riders are much more likely to be healthy. Yet the presence of bikes on city streets can be strangely polarizing. This is no doubt due to our current stage of infrastructure evolution – bikes are returning to popularity at a point where most urban streets are already congested. To car drivers, they seem like just one more hassle factor added to the daily commute. Six years after adding 255 miles (410 km) of bicycle lanes onto streets previously dedicated to cars, though, acceptance for the lanes seems to be growing. When polled whether the bike lanes were a good or a bad idea, 66 percent of New Yorkers gave their support, especially those living in Manhattan. Supporters mentioned environmental, health and safety benefits, as well as the addition of more space for cyclists to ride. Some respondents were simply happy that the lanes encouraged cyclists to stay off the sidewalk. Opponents complained that bike lanes hindered traffic, creating dangerous street conditions. “Everyone should be going in the same direction, and if we’re stopping, they should also be stopping and not weaving and bobbing in traffic, because it is a hazard for everyone else,” said Gloria Tingue from Brooklyn. A similar discussion is playing out in cities across North America. 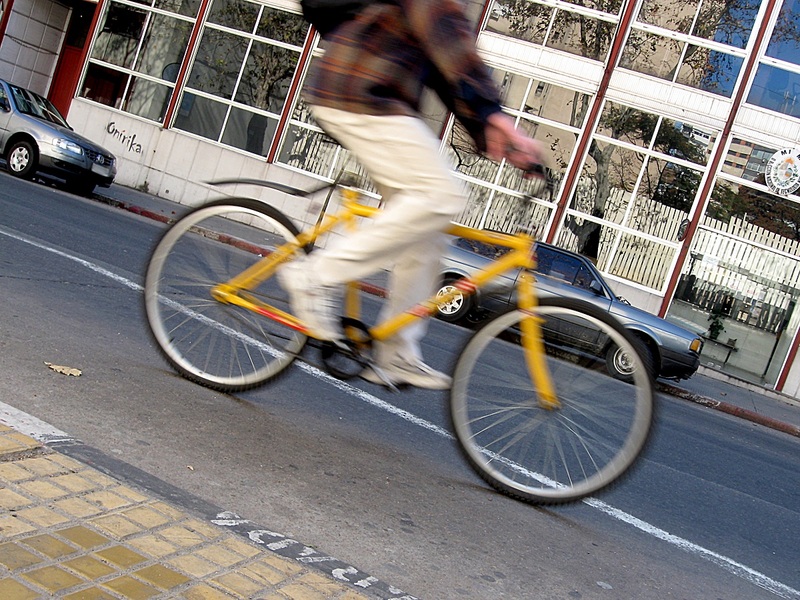 Vancouver, BC, is moving towards a bike-friendly future. The Vision-Vancouver council declared that its two-year trial of separated bike lanes downtown is now permanent. As well, the council recently approved plans to launch a bike-share program by spring of 2013. The Globe and Mail’s Frances Bula writes how the draft transportation plan “envisions an even more aggressively bike-friendly city, where trips by car are reduced from the current 60 per cent to only 33 per cent by 2040.” The future could include a comprehensive network of bike lanes on routes that link high-use locations and improved bike facilities in high-rider areas such as Kitsilano and Commercial Drive. The challenge for Vancouver – and most cities – is managing the awkward transition from streets designed for cars to streets designed for cars, bikes, transit and pedestrians. There will be bumps along the way. The northern Alberta city of Edmonton has moved to become more bike-friendly city by introducing “bike boxes” this September at the intersection of 116 Street and 87 Avenue. 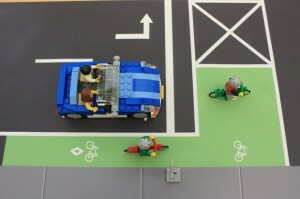 A big green square next to a dedicated bike lane will indicate where left-turning bikes are allowed to pull ahead of cars stopped at a red light. It should make the bikers more visible, said Andrew Siggelkow, the project engineer at Transportation Services. Biking in rush hour will be faster because riders can legally bypass any lineup at the light, rather than pulling onto the side of the street at an intersection. 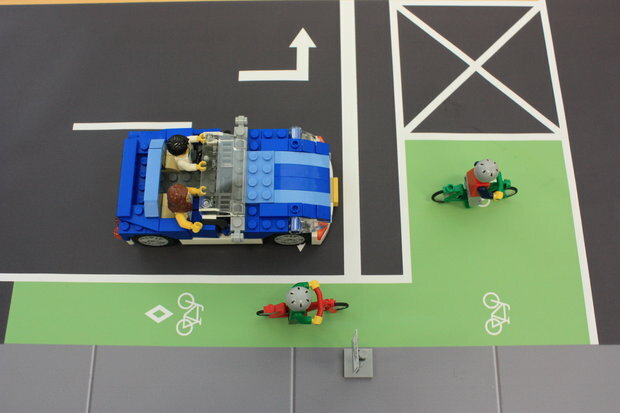 Bikes literally move to the front of the line, where they are safely in view and have a head start on traffic when the light turns green. Siggelkow noted that there are already bikes boxes in New York, San Francisco and other cities but the concept is new for Edmonton. See how bike boxes work in this video from Street Films. According to Tim Fernholz in Good Cities, research has verified the obvious: more bike lanes equal more bike commuters. The question was asked: what makes a bike-friendly city? Is your city is wet or dry, hot or cold, are gas prices high, is it densely constructed or sprawling, are residents young or old? None of those make a difference, based on a new study of 90 of the 100 largest cities in the U.S. Turns out the most important factor in bike ridership is simply the prevalence of bike lanes and paths. “The more infrastructure exists to encourage biking, the more people bike—and the more society reaps the public health, energy, and lifestyle benefits that come with an increasing share of people-powered transportation,” said Fernholz. When he lived in Washington, D.C., Fernholz rode his bike despite the summer humidity and chilly winters. After moving to Los Angeles and its mild weather, he barely rides because of the absence of road shoulders and fewer cycle paths. What’s happening in your city? New infrastructure for bikes? New kick-back from drivers? We would love to hear from you – comments and guest posts are welcome.